Are you looking to grow your business? Do you want to learn from the best? Do you want to know how pinnacle performers build behaviors and hone their skills to become the best at what they do? Do you want to know what big time salespeople actually do that makes them different? Would you like to know the shared traits of top performers so you can implement these traits into your practice? When I was part of a sales organization, the best part of every conference was getting the opportunity to listen from the top producers and to share sales ideas and best practices. If you are in sales or sales leadership please read on and pay special attention to how question #5 gets answered. Our latest guest on the RMA Weekly Spotlight is Stephen Harvill. He has just launched his brand new book, 21 Secrets of Million-Dollar Sellers: America’s Top Earners Reveal the Keys to Sales Success. I am very fortunate. Stephen’s team was kind enough to send me a copy of the book and boy, oh boy is it good. Stephen does a great job of blending the art and science of sales so that you can take action. When I think about upcoming conferences and the need for a great opening speaker, I am thinking about Stephen right now and this presentation. If you are looking to grow sales by helping your sales force get better then why not have them learn from 175 million dollar salespeople? Learn their best practices, build them into your culture and take action! Now, let’s learn a little more about Stephen, his new book, and what drives him. It is about the power behaviors of million dollar sales professionals. We conducted a two-year study of 175 million dollar salespeople in seven completely different industries and discovered the patterns of activities they all shared. It made no difference what they sold, cars, financial services, or real estate. These are the actual activities shared by these top producers. Salespeople need actionable plans to get better at what they do. It’s a professional imperative. These 21 “secrets” provide a structural menu of key activities that a sales professional can choose from to meet their specific growth needs. For over 30 years our success at Creative Ventures remains driven by one key factor – CURIOSITY. As we create our strategic platforms and have the opportunity to apply them within a wide range of businesses, services, and industries we discover new ideas that create leverage and opportunity for our clients. Keynote speaking is just one of the three ways we share our strategies and ideas. It is connected to our educational workshops and our consulting, which is the application of our ideas within a client’s company. 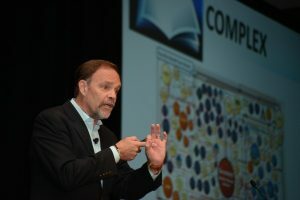 Keynote presentations provide a fantastic stage to share ideas with large groups of people and Speaking is a key leverage point for creating the connection between an idea and its impact. It is the connection that a client needs to turn an idea into an action. You have to build a bridge of understanding to an idea. The audience will enter the room with little or no idea as to what your subject and ideas are. It is my responsibility to connect content to value and I do that in three parts. “I GET IT.” It sounds simple but it’s critical. People have to understand the idea. They have to GET IT. That’s the first mission, the first part of the bridge. “I CAN DO IT.” They have to be able to execute the idea. They have to see the concept connect to action. That’s the second part of the bridge. I began my writing career about the same time I started my company, over 32 years ago. I was hired to write a monthly article for a National Magazine. After submitting my first piece, the editor called me and told me the article wasn’t fit for publishing. The editor knew me and had been in the audience for a number of my stage programs. He told me; “Steve, write like you speak.” That simple piece of advice created my “writing voice” and is a huge reason our new book ended up in a bidding war before Simon and Schuster ended up as our publisher. We are a project driven company. Every engagement has a beginning, middle, and end. This creates a very simple approach to our work. We are never driven by time, only by the outcome. Though our Dallas based team has semi-regular office hours, we are not the kind of company that gets walk-in business. 9 to 5 does not have a lot of meaning to us. We are driven by results and are very flexible in how those results are achieved. The worst thing I can hear is; “I didn’t have time to finish that.” Everyone knows that will be followed by me asking; “What did you do instead?” For us, time is about choice and how you choose to spend it tells me everything about our productivity. You have to know what’s important. Everyone starts their day with the OCT, the One Critical Thing. When that gets done first, everything else is just gravy! Creative energy. I seem to have a very deep well of energy around what I do. It’s simple to create productive energy when you get to do something you love. If you think about it, it’s really a miracle. That some of the biggest and most successful companies and organizations in the world actually care about what I think and how those ideas can create value-based decisions for them. We use the term “jazzed” all the time and it is a signature feeling. I’m always “jazzed” about our work. My wife, Laura, tells people that all this energy comes from being “easily fascinated.” I am voraciously curious and this curiosity leads me in new areas where cutting edge stuff is going on. It then takes that creative energy to figure out how something completely unrelated can be applied in a new and exciting way for my clients. John Wooden – The late UCLA basketball coach is a constant reminder of what it means to lead past your primary job. I had the opportunity to meet him and have read EVERYTHING every written about him. Walt Disney – Perhaps there is no better connection between imagination, risk and business savvy than Walt. I have studied his work, attention to detail and strength of commitment to the client experience. The Disney Company was also my first client! Leonardo DaVinci – It is impossible to find another human that displayed the richness of thinking present in Leonardo. From art, medicine, anatomy, engineering, science and inventive prowess, he provides a model that shouts, you can do anything! Sir Isaac Newton – Line up the top 100 scientists in history and you get to pick your scientist kickball team. You better use your first choice for Isaac. The Law of gravity, optics, motion, planetary orbital pathways, the creation or discovery of calculus all by the time he was 26! Newton teaches me how to explore and think. Specific: If I am working on a very precise idea I will limit my work to that single idea. This creates a laser-like focus around specificity. I ignore those things unrelated to my information needs. This requires way more concentration than when I am in the general mode of curious observation. It’s not just about reading and research but also about capturing the ideas that are important. I use the process of sketchnoting (creating images instead of words) as our idea capturing process. I fill notebooks and then transfer ideas to 8” X 5” cards. It’s not just being current; it’s being current around your idea. I am motivated by the challenges that push our projects past our current position. Projects that open up risk and opportunity. I am motivated by curious discovery. I am motivated by the development of an idea through prototyping and testing and retesting to see if it has “legs”. That experimentation drives value. Motivation is an interesting psychological concept. Most agree that it is “self-driven”. No one can really motivate you; you can only motivate yourself. People CAN inspire the way you think and that inspiration may move you, motivate you to do something. Thinking inspires me because thinking leads to new ideas. So, the inverse would be I hate people that waste my time. They express an interest in something and, despite your help, fail to engage at any level. Time is the only true currency, the only thing of real value and when it gets squandered, wasted and devalued, it shuts me down. I LOVE fiction in all of its forms. I have gone to the movies almost every Saturday since I was nine years old. Laura and I have a weekly date at the movies. We see almost 50 movies a year, AT THE THEATER! My love of movies has actually led to the creation of one of our programs, Why We Love The Movies. I have been an avid reader of comic books since I was a kid. Every Wednesday the new comics come out and I still have a child like excitement to see the new titles.I travel almost every week and fill my airport, airplane and hotel time with thriller books and Netflix series. I travel almost every week and fill my airport, airplane and hotel time with thriller books and Netflix series. I am a fiction addict!